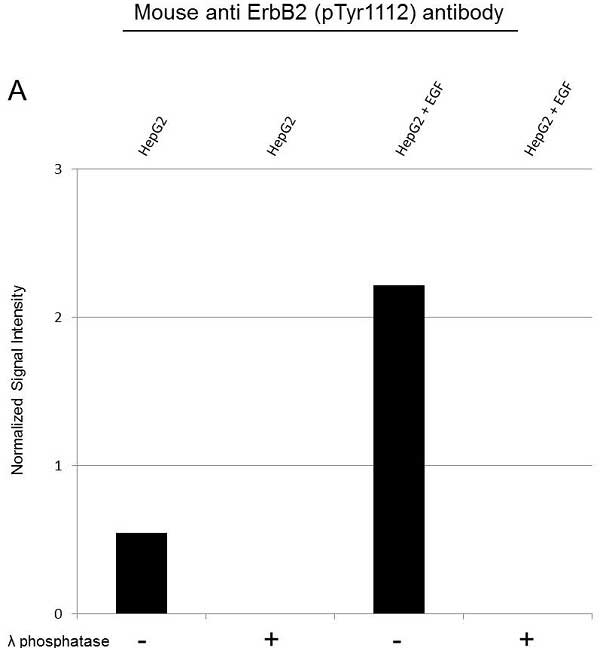 Western Blot analysis of HepG2 untreated and EGF treated whole cell lysates probed with (A) Mouse anti ErbB2 antibody (VMA00147) or (B) Mouse anti ErbB2 (pTyr1112) antibody followed by detection with HRP conjugated Goat anti Mouse IgG (1/10,000, STAR207P). Membranes were treated with (+) and without (-) lambda protein phosphatase and visualized on the ChemiDoc MP with a (A) 51 second or a (B) 10 second exposure. ErbB2 (pTyr1112) has a molecular weight of 185 kDa. Normalized signal intensity of ErbB2 (pTyr1112) from EGF treated and untreated lysates, treated with (+) or without (-) lambda protein phosphatase. Lambda protein phosphatase dephosphorylates serine, threonine and tyrosine residues. Normalized signal intensity was calculated by dividing the TPN-Normalized signal intensity for each phosphoprotein by the TPN-normalized intensity of the corresponding total protein. ErbB2 (pTyr1112) antibody recognizes ErbB2, also known as c-erb B2/neu protein, metastatic lymph node gene 19 protein phosphorylated at Tyr1112. 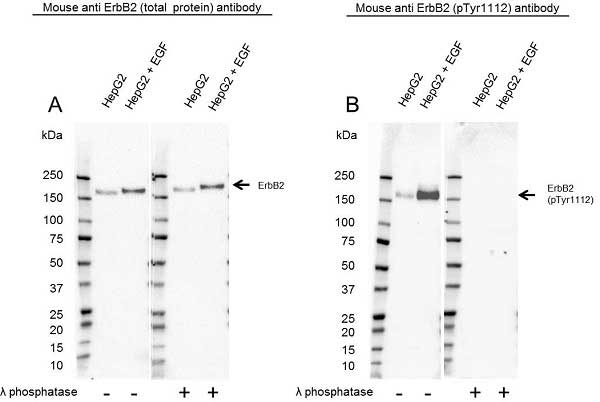 Mouse anti Human ErbB2 antibody recognizes receptor tyrosine-protein kinase erbB2, also known as proto-oncogene c-ErbB-2, receptor tyrosine-protein kinase ErbB-2, tyrosine kinase-type cell surface receptor HER2, when phosphorylated at tyrosine 1112. It belongs to the ErbB family of receptor tyrosine kinases (Muthuswamy et al. 1999), which plays an important roles in the development of organs such as the mammary gland (Xie et al. 1997) and central nervous system (Carraway 1996). Phosphorylated at tyrosine 1112 provides a docking site for c-Cbl E3 ligase, which mediates receptor ubiquitination (Hynes and Stern 1994). PTPN18 dephosphorylates ErbB2 on tyrosine 1112 thereby blocking the lysosomal routing of the receptor tyrosine kinase (Wang et al. 2014).